Kalonji Oil is used as a potent herb having several healing properties and keeps your body free from infections. 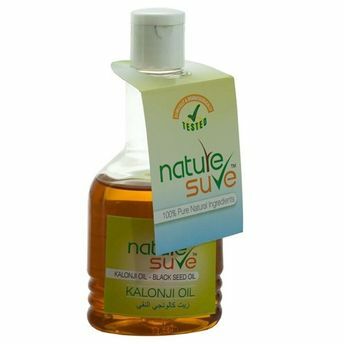 It is the best remedy for the treatment of baldness and hair loss. It is used as a home remedies for many health problems like blood sugar, blood pressure, body weight, skin related problems, pimples and acne, asthma, memory increase, allergies and hair loss, joint pain, weight management, cough and cold. It supports metabolism and helps in prevention and management of diabetes. It improves digestion, prevents gastrointestinal disorders and helps in lowering blood sugar levels. It soothes bronchitis, cures cough, treats insomnia or sleep disorders, increases body tone and prevents skin wrinkle. It stimulates menstrual periods, improves flow of breast milk, improves sperm count and provides quick energy. Due to its medically proven preventive and curative properties, Kalonji (black seed, nigella sativa) has earned the recommendation of World Health Organization as a herbal remedy for many diseases. Additional Information: Owned by Wet & Dry Group, Nature Sure is a young and dynamic company focusing on health and wellbeing of people. The company is born out of passion to create unique products and solutions for the evolving needs and desires of modern consumers. They research about these emerging needs and desires emerging out of the changed lifestyle of current and future generation and develop solutions so that people enjoy their self at best.